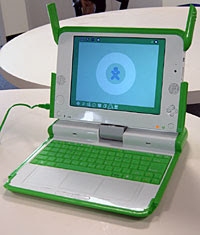 Late last year the One Laptop Per Child (OLPC) initiative released working prototypes of their computers. This is an amazing development for those interested in technological advances, education, or human-computer interaction. What looked like a pipe-dream is becoming a reality! For those who don't know, OLPC is a humanitarian educational project designed to bring a cheap, durable and efficient computer to children in the poorest parts of the world. Initial skepticism about the need for computer technology in these conditions can be assuaged by reading the wiki. The first computer, the B1, is a technological marvel. It automatically connects to others nearby to create a peer-to-peer network that enables collaborative learning and sharing of resources. The screen is more than double the resolution of those commonly used, and yet requires a fraction of the power. In fact the laptop as a whole consumes one-tenth of what a normal computer needs. It has no hard drive but rather half a GB of flash RAM. This device is not designed for storage but rather as an enabling tool. For connectivity there's USB ports and an SD slot. A microphone and speaker are supplemented with audio input and output sockets. Intriguingly the input can also be used for other environmental sensors, allowing the computer to be used as a component in a dynamic sensing array. Since much of the developing worlds has limited access to power, a key element in the design is the ability to charge the battery using a variety of physical devices; currently a crank, pedal, or pull-cord are available. There's a lot more cool stuff. The touchpad is also a writing sensor. There are two sets of dedicated cursor keys for games. The wireless networking is the best available in any computer. It's built without recourse to hazardous materials. There's a built in video camera. You can view lots of pictures of the B1, or read in detail about the hardware. I discuss the Python development environment over on my sister site, Diagrammes Modernes. This is a brilliant device that I hope will influence commercial domestic computer design. The first batch will ship by the middle of the year. If I could I'd buy six. Especially if they came in black!